HMI: Concrete Leveling Solutions for Municipalities & D.O.T. Big-time work, on a municipal budget. In a world where municipality and county budgets are under continuous pressure and the compliance requirements are increasing, there’s no better way to take back control of your costs and time than by raising and leveling your own concrete. Our systems offer a solution where your departments and employees can do the work, speeding up your repair response times and reducing the overall impact on your annual budgets. 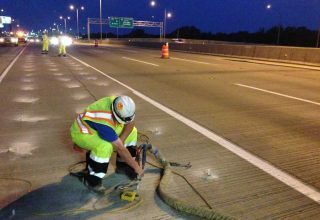 Road repair: instead of spending your budget and tax dollars on costly contractors and material for road replacement and repair; save money, time, and keep your team busy by raising concrete. Sidewalk repair: raising uneven concrete slabs of sidewalk, will save you time and money versus replacing sidewalk slabs, making your sidewalks safer to walk on. Culvert and curb repair: fix culverts and curbs easily with HMI polyurethane equipment, improving drainage flow, reducing potential water damage. Secure the equipment required and train existing personnel on concrete raising and leveling. Receive FREE ongoing service and project support. Mitigate legal exposure for noncompliance with trip hazard regulations. Experience huge savings and expedite solving infrastructure challenges. Increase the productivity and capabilities of existing personnel. I am very pleased with HMI. They have been responsive, helpful, and our new equipment is allowing us to do the work ourselves while we save money! Want to learn more about how HMI can help you improve your community? Home » Start-ups & Expansion » Municipalities & D.O.T.